Rowan Utting’s debut novel started in the Tawa College library when he was 14½ and finished, recorded in his manuscript, at 00.45am on his 16th birthday. That’s his Aspergers coming through. Surprisingly that may have enhanced his observation and understanding of the human condition. Many of his characters are not human but may take that persona. The reader’s viewpoint is frequently dramatic standing in the role of the character. Dialogue advances action or setting. Rowan is a natural poet caring for the sound of the language and with few words can be highly evocative; with more, a stirring battle speech. Interspersed is a leitmotif from a poem about loss and life. There are further songs to enhance the mood with a special tender one for the naming of Harhounn, a new-born dragon. The Stones of Home is set amidst a vast backstory. The Mages of Haven have acquired the duty of guarding the use of magic in the world. Past misuse brought about the Great Flood and separately sunk Atlantis. Early in their journey the Mages have to deal with Fingal the Scottish Giant and his wife. The boundaries of human reality are broken and the Mage of Stone can slip like a seal into the ground for travel or household excavation. Other Mages have other powers. The setting is contemporary Scotland and Ireland. Be prepared to cry: this book has a high emotional content. It deals with death, birth, love and the heroics of battling for the right to survive; not just for the Mages, but humanity too is at stake with the evil endeavour to capture magical power. This is not a book of spells but the use of magic is part of its world. You need to open your mind’s eye to read it or miss the subtle imagery or the magical realism unfolding. How else do you grow a giant tree in the Irish Sea or provide a needed escape, or a gravesite? Dragon rides for tigerwolves?Comedy is there too as well as literary allusions. The active theme is the struggle for guardians to do right and the consequences. It could be viewed as a contemporary allegory with multiple layers and despite the demise of characters you expect there are lives to be explored at another time. The book oscillates between tension and laughter. You feel the hard slog of life in a war zone and alliances have to be forged; past enemies need to be reassured and the poignancy of death seems ever-present but hope remains. At the end there is peace. Rowan Utting has created a multifaceted work. For a debut novel this is extraordinary. He shows an understanding far beyond his years. While it could be read by a 12 year old the descriptive violence makes it more suitable for high school and up, including adults. “Alamard” is Rowan’s new embedded Elven language presented with a 400 plus word bi directional lexicon, pronunciation guide and grammar. Do we have a potential Tolkien? With included translations Alamard is used throughout the book and sounds like quintessential European—somewhere middle north? Easy to write, with an exemplar translated poem, Alamard is full enough to use as a private language. Rowan’s own songs appear throughout and some can be heard on his YouTube Channel. His notebook sketches of potential characters are included appearing also as the cover dragons and tigerwolf. 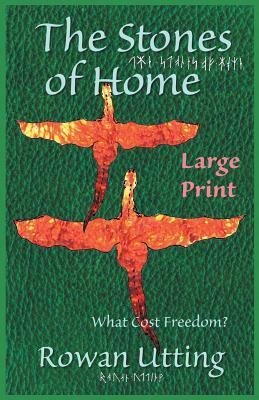 The Stones of Home: What Cost Freedom? is a rare book: it’s quotable and memorable. Well done Rowan.